The mythical tales and mythological stories of India are often enacted in form of dance or drama or dance drama on stage. Most of the time, professional activists and theater artists organize such stage performances to bring in a social reform, convey a message to the mass and awaken society for a cause through entertainment. It is more of a commercialized art or social activism with a purpose, and less of a festive tradition to appease or please the Divine. One such ceremonial tradition is Kerala’s Theyyam Festival. Among the offbeat Indian festivals is the “Dance of Gods”, which is colloquially known as Theyyam Festival in Kerala. 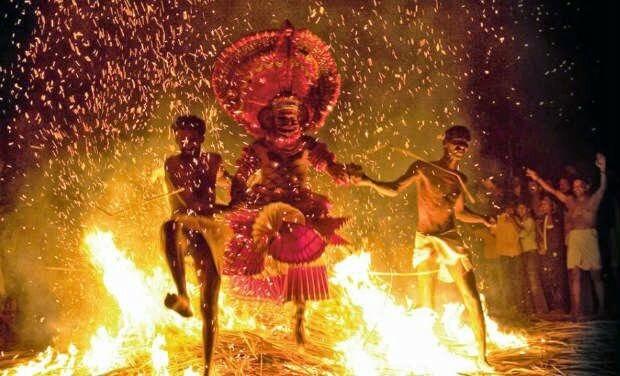 Unique to the folk culture of Kerala India, this dance festival is a most spectacular ritual in worship of the Goddess Kali. Previously, only the temple priests living at upper rungs of the social ladder were privileged to hold on to the festivity as their inborn right. With the fading rigidity of casteism in the progressive society of Kerala, they lost the monopoly of Theyyam Festival to a mass celebration by common man. Theyyam is an 800-year old celebration of divinity and devotion in the northern Malabar region of Kerala. It is a most visually impressive form of cultural enthusiasm among the people of different castes. With its root steeped in the age-old Dravidian culture of South India, Theyyam is a mélange of dance, drama, music and mime. Though it has become a tribal festivity, the subject of performance is the glory of divine heroes and celestial spirits. The ceremonious dance is accompanied by the chorus of such musical instruments as Chenda, Elathalam, Kurumkuzal and Veekkuchenda. Among the Indian festivals in winter, Theyyam Festival of Kerala runs from December to April making it the best time to visit India for cultural tourists and art photographers. The musical dance performance is ritualistically held at some 1200 temples from north Malabar to south Malabar. Each participant represents a heroic character with divine power. Performers wear heavy make-up, huge masks and flamboyant costumes for dramatic appearance and spectacular presence. There are surprisingly as many as 400 forms of Theyyam; each being unique in style, music, choreography, make-up, costumes, etc. Pottan, Kari Chamundi, Gulikan, Vishnumurthy, Nagakanni, Veerali, Raktha Chamundi, Bhagavati, and Mutiappan are some of the most popular forms of Theyyam in Kerala. 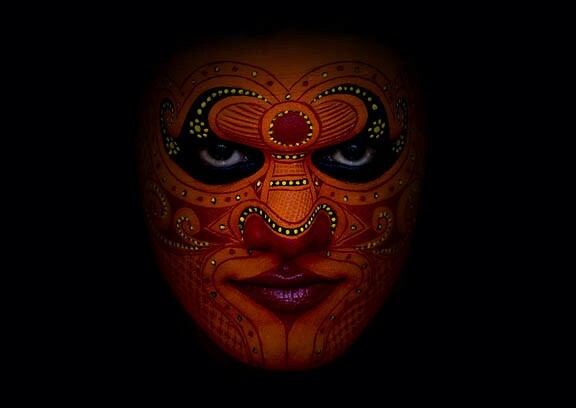 Face painting is what all these different forms of Theyyam have in common. Performers get their bodies painted with bright colors in varying designs and patterns from top to toe. In some forms of Theyyam, the costume is made of coconut leaves for the lower part of the body, while the upper part of the body remains bare and painted. In some other forms of Theyyam, performers smear the body with a paste of rice and turmeric. Headwear is the heaviest and largest part of the costume. Headdresses are made of different materials including bamboo sticks, wooden boards, peacock feathers, coconut leaves, and flowers. Such ornamental make-up and costumes help performers personify the grandeur of mythological figures including gods, goddesses, spirits and demons. What is the most offbeat about this Indian festival is that a few Theyyam forms require performers to wear bamboo crowns as high as 50–60 feet, which are supported by other people from behind. Either a piece of colorful cloth is used or coconut leaves are weaved together to cover the crowns. A silver replica of serpent embellished with red flowerers is seen around the necks of some performers. Those representing goddesses or female mythical figures wear wooden breasts adorned with ornaments and studded with gems. As per the legends of Theyyam Festival, the people of north Malabar got the right to perform Theyyam from Parasurama, the sixth incarnation of Lord Rama. It is also believed that the mortal bodies of performers become one with immortal spirits and mythical figures to perform ritual dances and caste a trance over onlookers. The performance ends with distribution of turmeric powder as a token of blessing to the devotees. In return of the blessing, they sprinkle rice grains over them performers. Some performances held in temple premises and courtyards continue to enchant the audience for hours. Evidently, the season of Theyyam Festival from December to April is the best season of Kerala Tourism for cultural enthusiasts on a visit to Incredible India. Kerala has good air connectivity with all major American cities via the Middle East cities: Abu Dhabi, Dubai, Doha, Istanbul, Amman and Bahrain. Online booking of flights to Kerala from USA is the cheapest at Indian Eagle. Travel to Kerala India this winter is not a matter of second thought! Enjoyed reading this article? Please hit recommend and share with others. The Coffeelicious on Twitter and Facebook.